One January night about ten years ago, the co-founder of TKO Clamping Systems, Tim Magagna was in an Auto Zone when a guy came in asking if anyone could give him a ride back to his vehicle on the interstate. Despite not really wanting to drive this guy back to the interstate, Tim had an overwhelming feeling that he was supposed to. What had happened was the guy had blown a radiator hose. So for the next hour or so, Tim worked under his car in -10 degree weather to try and get a banded clamp to stay in place and tighten around the radiator hose. The whole time he was under there he kept thinking “how easy would it be if I could just reach up and snap the clamp on”? That was the birth of TKO’s premium hose clamp. He then took his idea to Stan, the founder of TKO Clamping Systems who then came up with the design for the premium hose clamp featured at TKO Clamping Systems today. 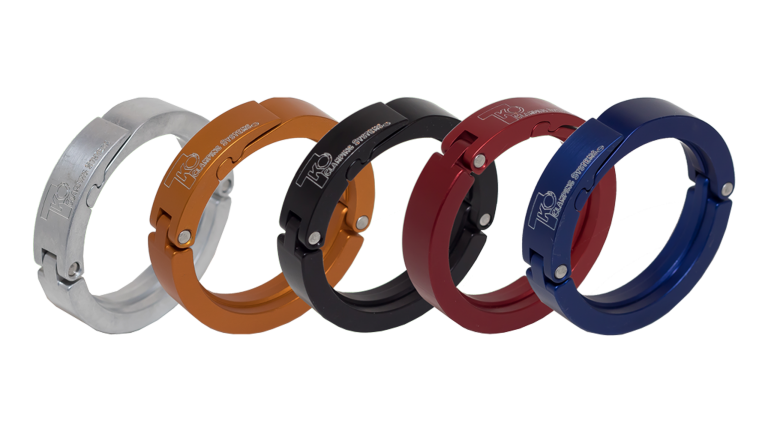 A multi-hinged, 3 part clamp machined from 6061-T6 aluminum and available in five different anodized colors. Additionally, these clamps come in 8 completely different sizes, from premium hose clamps that fit the gas line all the way up to the largest of radiator hoses to include your thermostat housing. Not only are these hoses, efficient, they also add a finishing touch of bling to your daily driver, show car or even off road vehicle. Our Clamps are machined from aircraft grade 6061-T6 aluminum. We chose this metal for its outstanding durability and incredible strength, both of which were characteristics we wanted to incorporate into our clamps. Each clamp is then meticulously sized to create a custom fit, unlike old fashioned banded hose clamps. Each clamp also comes with with three different compliant liners that are 1/64” thick, 1/32” thick, and 1/16” to create tighter fit and remove the marking or denting that the convex ridge may create in your hose. One of the most important critical factors that went into the design of our premium hose clamps was creating a hinge that was simple and easy to install. The multi-hinged 3 part design of the aluminium band allow the clamps to open wide enough without the need to remove any hoses, along with a convex ridge along the inside diameter which allows for a “seal” that is easy to clamp into place and displaces a minimal area of hose during the installation process. To create a tight and secure lock, each clamp features a negative angle locking latch system. For more information or to order a premium hose clamp from TKO Clamping Systems, contact us today.